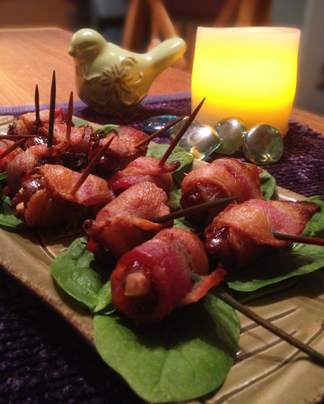 Here's a final appetizer idea for your northwest New Year's Eve party. Of course, you will want to use wild-caught salmon or steelhead, local organic chevre and the spiciest red onion you can find! 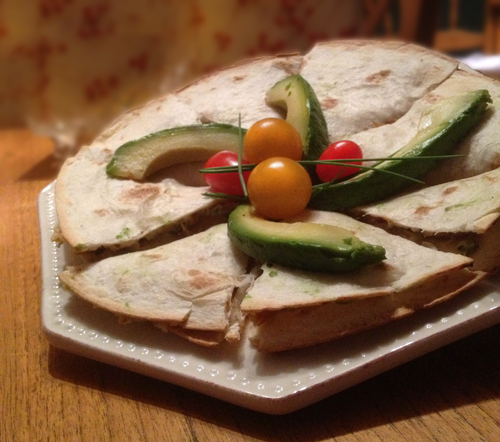 This recipe is good with salsa but I like to serve it on it's own as a party appetizer. 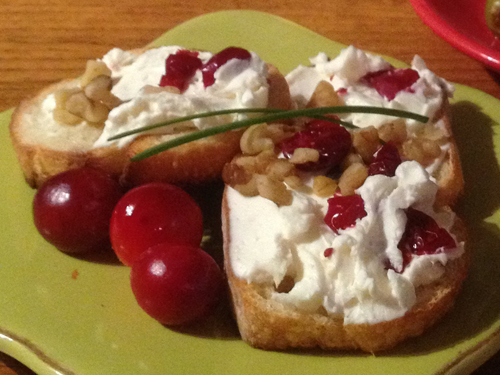 This torté is pretty and festive as well as being a very hardy appetizer. 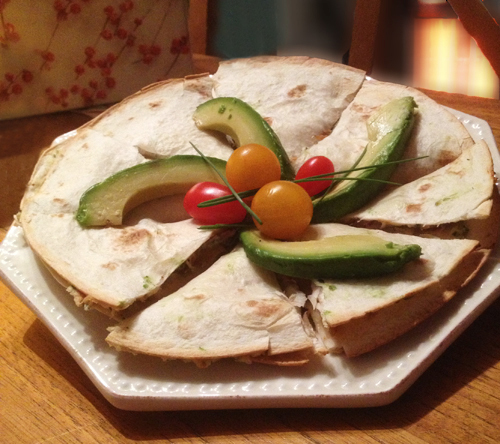 During the holidays, when the alcohol tends to flow, this dish is a good one to have on hand. A small amount will ensure something more substantial than holiday cheer is fueling your guests! Appetizers account for some of my favorite adventures in the kitchen. It seems like everyone can find something to nosh while the party is going on. Unlike dinner, there are sure to be plenty of small bites without any single item dominating the party. I discovered a vegetarian pâté similar to this at a wine tasting at Tyee Vineyard. That was years ago, and I regretted not getting the recipe at the time. On the other hand, it's been great fun experimenting with combinations and amounts over the years. I've finally settled on this one. I hope you like it! 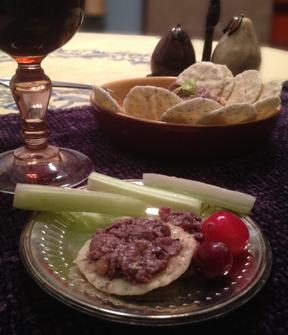 Since New Year's Eve is around the corner, I thought I would post a few appetizers that are sure to please and easy to make. 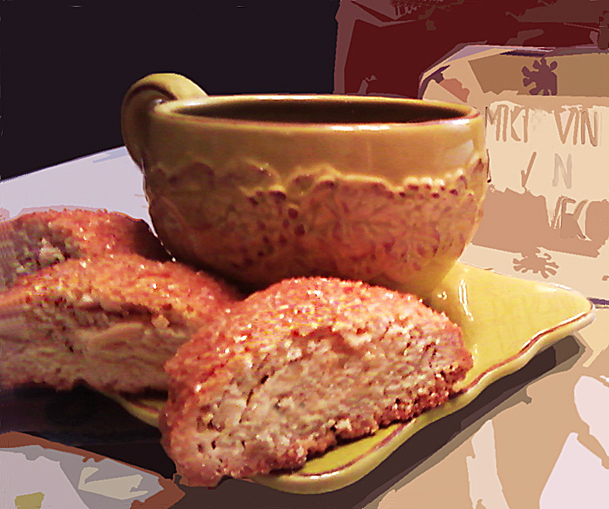 This one has been popular for many years - I certainly didn't invent it - but they're usually stuffed with almonds. I decided to try hazelnuts instead. They are a little more difficult to stuff but the hazelnuts work well with the sweetness of the dates, so I think it's worth the effort. If necessary, chop the hazelnuts into quarters. The last of the edible gifts is my favorite cookie. These are not common on the west coast, but are easily adaptable. Almonds are so abundant here that when I get them on sale, I freeze them and save them for just this reason. This cookie is a little different in that it has no flour, and no added fat. The nuts do most the work here. Slivered almonds are ground into a paste that replaces flour and butter as the base of the cookie. Pine nuts, (pignoli) cover the cookie. I learned to make these at first because they're very expensive to ship and they are better when they're fresh. Now I make them so I can be sure that the ingredients are organic and as close to our region as possible. These can be a little tricky to make at first, but well worth it. Long before the fig met the Newton, it had a thing going on with the Cucidati. 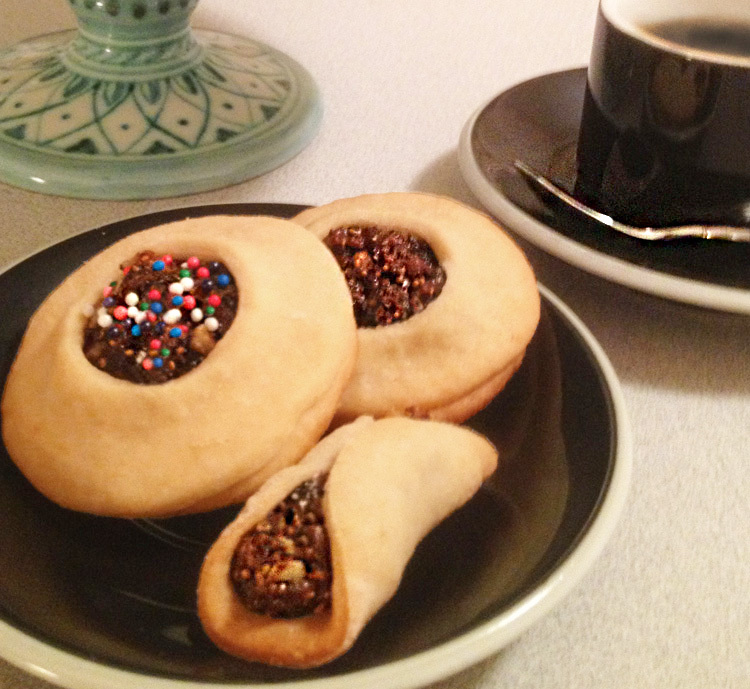 Cucidati, it turns out, is the Sicilian name for Fig Cookies. Whatever you call them, they are, in fact, a traditional Sicilian Christmas cookie and my grandmother used to make them every year. 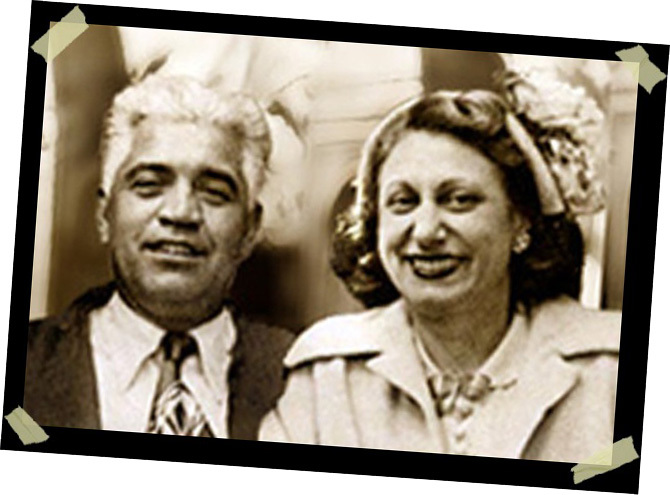 You can probably see by the picture that my grandmother wasn't what anyone would call typical, at least not in that Sicilian "Nonie" sort of way. In fact, she wasn't terribly interested in cooking. She loved to bake though - and she loved these cookies enough to find a recipe and write it down. I'm so glad that someone in the family found it and passed it along. I've updated it a bit seeing as how actual measurements are much easier to follow than "some walnuts" or "enough brandy." I also use a food processor, so I've added that. Naturally, the ingredients are organic. Many thanks to Sundance Natural Foods and Capella Market for staying stocked up with a variety of dried fruit. Figs are tough to find this year! You can make the fig mixture up to 2 weeks in advance but it's not necessary. The time reflected in my estimate includes 2 hours for making the fig mixture. I've made these with rice flour for my gluten-free friends and they are much more delicate, but the taste is still nice. If you try that, I recommend rolling them instead of pressing 2 cookies together. There are some things I'd rather leave to the experts; lawn care, computer maintenance and making biscotti are among them. These twice-baked cookies have been around for centuries and most cultures seem to have their own version. They were the treat of explorers and the working-class because of their resistance to spoiling. The second baking makes the cookie a little harder, dryer and, therefore, long-lasting. 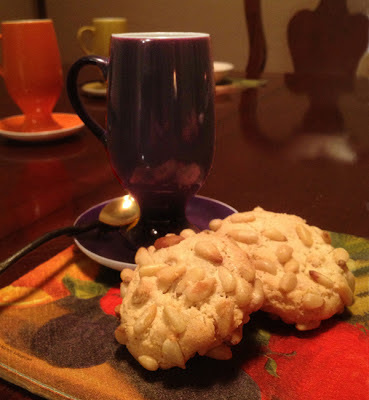 My sister, Laura, makes a biscotti that begs to be enjoyed with a cup of coffee. 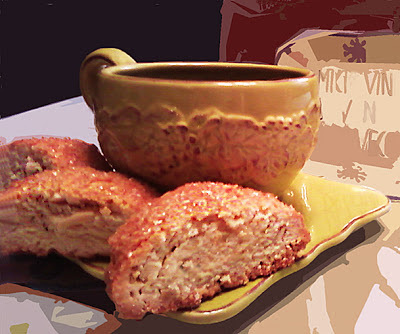 If you're like me, you've probably enjoyed the biscotti offered at coffee houses; those big, sweet, crumbly cookies. Well, these are different; they're much more like the traditional biscotti I found in Italy. Laura's recipe gives a nod to that traditional dense and crunchy cookie, but appeals our modern taste with a surprisingly simple variable: slivered, not whole, almonds. Slivered almonds are smaller and are better incorporated throughout the cookie. The biscotti are still crunchy, and "dunk-able" but the almonds allow them to yield when you take a bite. The flavoring is also different than most commercially made biscotti. They have plenty of sugar but they don't strike me as particularly sweet. If you like a more traditional biscotti, or are a fan of anise, this one's worth a try. Many thanks, sis, for sharing the recipe, providing the pictures and giving us these important tips: When it comes to extract, use the pure stuff - anything else is an assault to biscotti everywhere. The dough is dense, so a stand mixer will make the process much easier. If you've had garlic butter, you've had compound butter. It's really just a fancier way to say that the butter has been flavored. If there is a difference it might be that compound butters generally have more ingredients and, therefore, tend to be a bit more complex in flavor, aroma and appearance. Some are used in place of sauces on meat or vegetables, others are better suited as spreads for bread and pastries. Why not put an assortment on the table and let everyone decide for themselves? 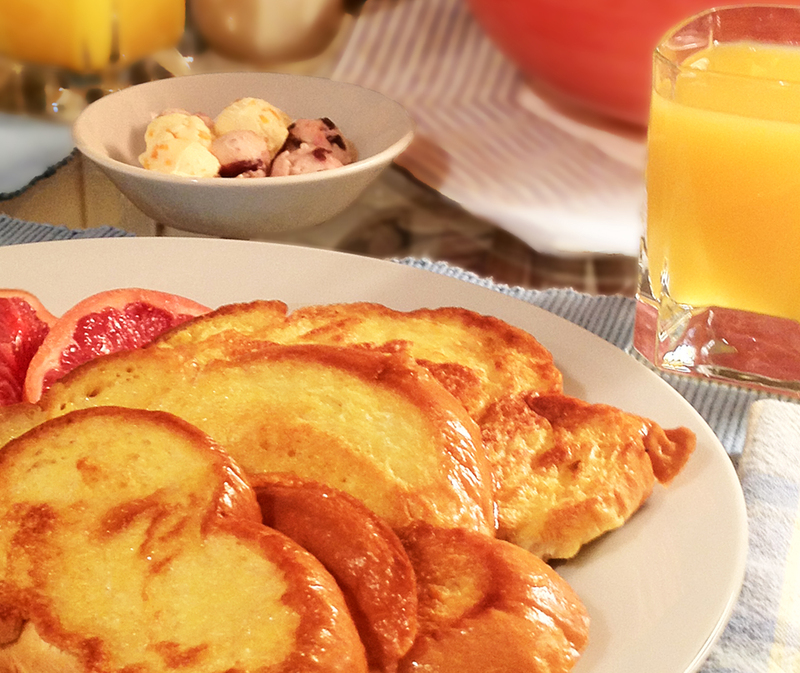 Besides, that sweet dish of flavored butter next the to French toast really classes up the joint. As gifts, compound butters have been well received. That said, I learned that I was giving away more butter than most friends could use. In this case, more is not better. Compound butters don't keep as long as plain butter (3 months tops if refrigerated) so a sampling of two or three different flavors is probably enough for anyone who isn't accustomed to having it around. It would be a shame if the hand-crafted butter were to be discovered in the bottom of the vegetable bin in August! After you've blended all the ingredients, and shaped the butter into a log, leave it out on the counter for about an hour and let the flavors develop. Once it's refrigerated, and is firm again, you can easily divide it into thirds and wrap each in fresh wax paper, then in plain paper or cloth. Part of the fun is giving each flavor a less generic name and making labels that can be attached to the outer paper. This also allows you to add a "use by" date and a few serving suggestions. It's probably no surprise that I like to give edible gifts during the holiday season. A few years ago I started to feel like we were all exchanging cookies -- not all bad -- it's just that I think my friends got the short end of that deal. That was the year I decided to get creative about it and found another confection. I found this recipe online several years ago. The person who posted it claimed that it's from The French Laundry, a foodie's dream restaurant in Yountville, California. I don't know if that's true, but it is a great recipe. I've varied it a bit over the years but today I've settled on two favorites. One is classic vanilla, my variation uses double the vanilla extract and 2 vanilla beans from Mountain Rose Herbs in Eugene, Oregon. 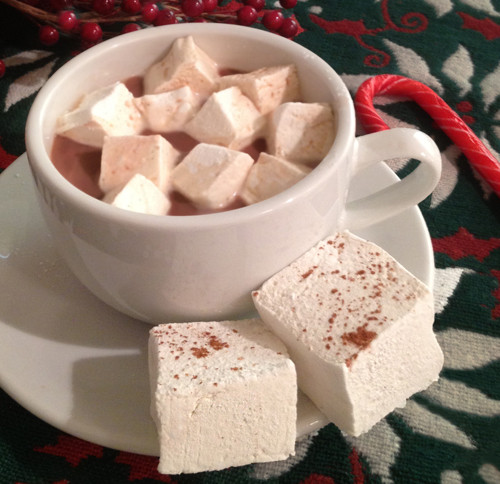 Since marshmallows are popular with kiddos, and the vanilla doesn't cook, I use alcohol free extract. The second variation is blackberry. I love the blackberry spread from Sweet Creek Foods and I was fortunate to have some on hand -- just enough to make a half-batch. The recipe will make a full batch though. The reason I recommend this spread is that it has less sweetener than most jams so the blackberry taste comes through. Be forewarned -- marshmallow making is sticky business. You'll want to get everything you need within reach, measured, and ready to go before you start. If you do that, and remember to lightly oil everything, you'll get through it just fine. I strongly suggest an electric stand mixer. Ah, struffoli! 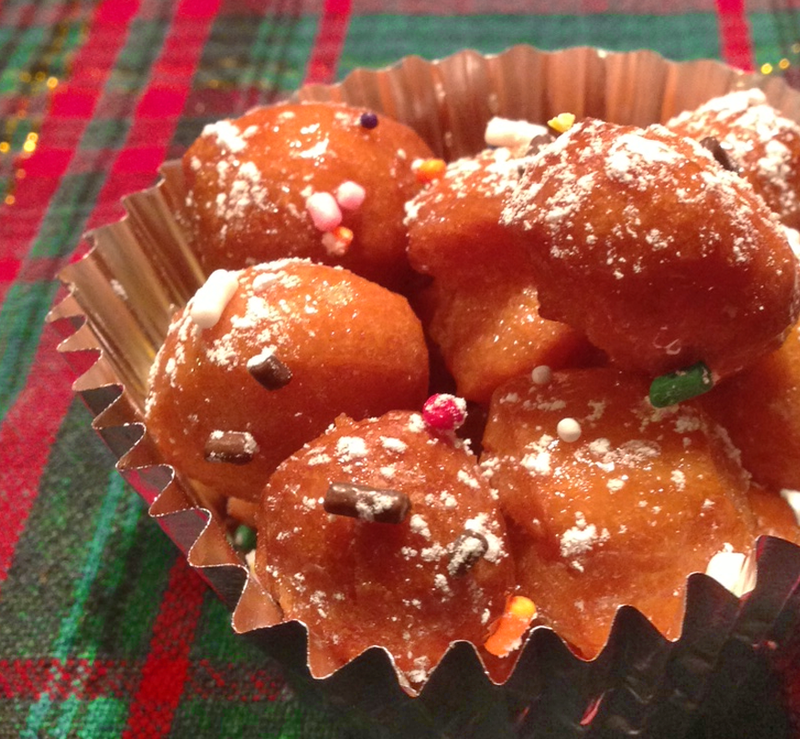 This is a Neapolitan confection that consists mainly of bite-sized balls of fried dough. Doesn't sound as festive as it looks, does it? It is though, these are those tasty little jewels on the holiday dessert table. When done right, they're not greasy, just a little crispy and light as air on the inside. Years ago, after moving to the west coast, we tried to recreate them but over-worked the dough. Don't do that. Boy, were they tough! As with all dough, handle it as little as possible and follow the directions. You'll do fine. My cousin, Grace, makes struffoli every year and she was kind enough to take over the blog duties for me on this one. Count this among those recipes that are passed from one generation to the next. Grace's Aunt Lisa passed this one on to her. Many thanks for sharing! Happy National Comfort Food Day! Yeah, I didn't know either but when a friend asked what comfort food I was going to blog about, I decided to stop on the way home and pick up the ingredients to make this classic. A few years ago my friend Carrie brought this dish to a pot luck and everyone raved. I think she brought it to make sure the kids would eat but the adults couldn't stay away. I asked her for the recipe and was surprised that among the ingredients was cauliflower. It was undetectable. She explained that she likes making this because she knows her family is getting veggies as well as all of the goodness that goes along with a home-cooked meal. I've adapted this recipe so that I could use my immersion blender, but you can use a regular blender, food processor or even an old fashioned potato masher. The cauliflower is surprisingly easy to puree. My spin on this comfort food is that most of the ingredients are organic and from around the region and we can find comfort in that, too! 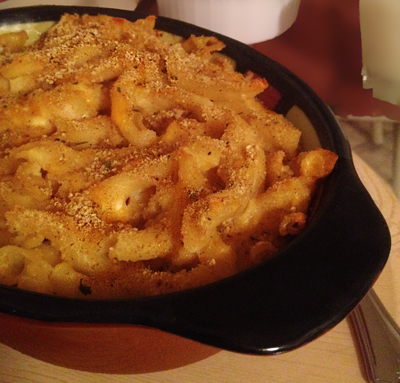 I should explain that I tried to score some locally made macaroni, but it's just not available. The folks at Pasta Plus gave me a couple of suggestions for quality organic imports though and I even found one on sale at Capella Market. Good company, Mick Jagger and an Ill-tempered Gnome - huh? This weekend I got together with friends to watch Crossfire Hurricane, the documentary celebrating the 50th anniversary of The Rolling Stones. 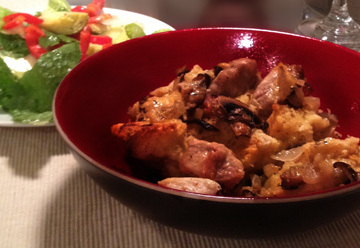 I decided that this rainy Oregon weather was perfect for a Savory Bread Pudding. It was also a great night to try Oakshire Brewing's seasonal winter ale, Ill-tempered Gnome. The beer tasting began when company arrived and while we waited for dinner to come out of the oven. Ill-tempered Gnome was a hit as a seasonal winter ale and a great addition to this recipe. I'm a little preachy about cooking with fresh, local, ingredients but this recipe is also great way to use leftovers. If you plan ahead you can cube and freeze stale bread until you're ready make this dish.